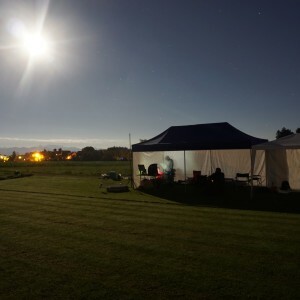 some of you might remember the 28-hour and 81-hour solar-powered flights (the world record in flight endurance for all aircrafts <50kg) by our Pixhawk-powered AtlantikSolar UAV that was presented here at diydrones last year. This year, we have not focused on records, but have been integrating more of our research at ETH Zurich. 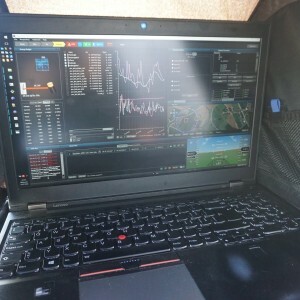 The result: The first-ever fully-autonomous (including launch, autonomous thermal updraft tracking and landing) solar-powered perpetual flight with significant payload (Color + Thermal Camera + Onboard Computer + WLAN for image live streaming) in a 26-hour Search-and-Rescue (SaR) mission. One year after having demonstrated the 81-hour continuous solar-powered flight that is still the current world record in flight endurance for all aircrafts < 50kg total mass, the AtlantikSolar UAV has completed its next milestone by demonstrating the first-ever fully-autonomous (from launch to landing) solar-powered perpetual flight with significant payload (Color + Thermal Camera) in a 26-hour Search-and-Rescue (SaR) mission. While the 81-hour and 28-hour endurance record flights were important milestones that demonstrated the perpetual endurance capability of AtlantikSolar, they required manual pilot control for launch and landing and did not carry any aerial imaging payload. However, the missions that our team really cares about – Search-and-Rescue missions relying on long-endurance aerial sensing to support authorities e.g. in the European refugee crisis currently unfolding over the Mediterranean Sea – require both of these elements, i.e. ease-of-use through full launch-to-land aircraft autonomy as well as significant payloads to help the rescue teams with the detection of victims on land and sea. SaR payload: The aircraft carried a 10 Watt 300g payload (1 Color camera, 1 Thermal Camera, 1 ODROID onboard computer with WLAN) and performed victim detection from the air during day and night. Environment-aware: The aircraft performed automatic thermal updraft tracking for increased energetic efficiency and to speed up the battery recharge. 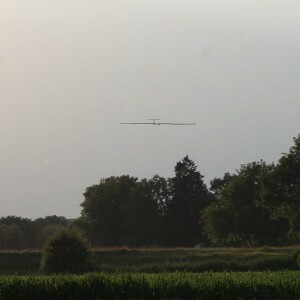 The 26-hour flight was started on July 19th at 18:02 local time in Hinwil, CH with full batteries. The launch was performed fully autonomously: After all system checks were complete, the aircraft was tossed in the air via a hand-launch and then continued automatically and without pilot interaction towards its first loitering waypoint. The respective flight control technology is based on an ETHZ/3DR Pixhawk autopilot with a custom flight controller designed at the Autonomous Systems Lab. 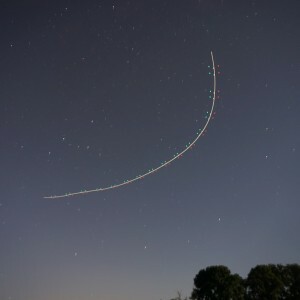 Equipped with a color camera, thermal camera, an onboard computer and wireless LAN, the aircraft began live-streaming the respective images. The full payload was operated until around 21 o’clock, after which the color camera was switched off because of the insufficient lighting conditions. The batteries were at 95% state of charge at that time, having started their discharge shortly before 20 o’clock. Note that operating a fully fledged SaR payload consuming 10W is a significant challenge for perpetual flight on a small-scale solar-powered UAV such as AtlantikSolar, and the overall power consumption of ~60W was thus closely tracked during the first hours of the evening flight. The actual testing of the Search-and-Rescue capabilities were started shortly before 23 o’clock: With the aircraft now flying in total darkness, the infrared camera served as the only source of aerial imaging information. As visible in the video, the payload system clearly manages to find the victim lying in low grass (and surrounding houses, tents, cars, the streets and especially the warm electric generator) at 23:05 o’clock. The victim detection was performed manually by the ground station operator based on the live-streamed images this time. However, the next AtlantikSolar test flight will have automatic on-board victim detection (as already tested in the ICARUS search and rescue project) implemented. The demonstrated capabilities are integral elements of perpetual flight aerial victim detection missions – we are convinced that they can be of great help in solving pressing issues such as the European refugee crisis of 2015 and 2016 above the Mediterranean Sea. Despite heavy winds of up to 8m/s, the Search-and-Rescue support activities with the infrared camera payload were continued throughout the rest of the night. First sun was hit at 06:20 local time on July 20th, and the minimum battery state of charge was reached with 26% battery energy remaining at 08:04 o’clock. Considering the additional payload power consumption (and mass) of 10W , this energetic margin – achieved on July 20th, and thus about one month after the solar solstice on June 21st – is a success and even exceeds the margin of 23% predicted by our simulations. To accelerate the battery recharging process, the aircraft also implemented autonomous thermal updraft tracking that was enabled during the late morning once thermal updrafts were encountered (see video). Multiple “free” altitude gains of >100m were achieved this way – again without any pilot interaction. The batteries were fully re-charged at 15:30 o’clock. As a final step, and after 26-hours of solar powered flight, the aircraft performed a fully autonomous landing at the Hinwil, CH airfield. 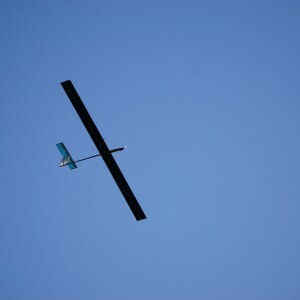 Using its lightweight LIDAR (Light Detection And Ranging) sensor to measure its distance to the ground, AtlantikSolar – a hard to fly aircraft that can usually only be steered and landed by extremely experienced pilots – could safely perform the automatic landing. We consider the demonstrated full flight autonomy a vital step to allow search-and-rescue support teams, which usually do not possess extensive UAV flight training, to benefit from the signficant advantages of solar-powered and in general high-performance UAVs. Detailed design and technical information on the UAV platform can be found in “Oettershagen P, Melzer A, Mantel T, Rudin K, Lotz R, Siebenmann D, Leutenegger S, Alexis K, Siegwart R (2015), A Solar-Powered Hand-Launchable UAV for Low-Altitude Multi-Day Continuous Flight. In: IEEE International Conference on Robotics and Automation (ICRA)” [Download] . An additional up-to-date publication including the research for this flight is planned. Live-streamed RGB camera image. Our tents are clearly visible. T=5h. Flying at night with position indicator LEDs on. T=5h. The airplane is seen loitering in the top left, performing the SolAIR Search-and-Rescue mission. T=13h. 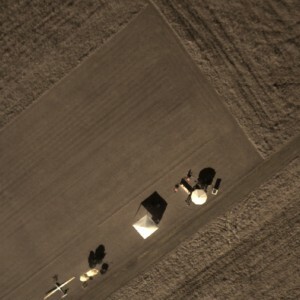 Ground Station on the next morning. We’ve received first sun here. T=26h: Final approach during the autonomous landing. AtlantikSolar AS-3 after its 26-hour fully autonomous solar-powered SaR mission. 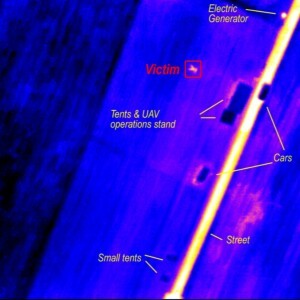 This research was funded through the research project SolAIR – Solar-powered Automated Aerial Imaging and Reconnaissance Using Infrared Cameras. SolAIR is a project funded under Armasuisse contract #043-12. The AtlantikSolar project is in addition funded with ETH Zurich’s internal resources, private supporters, and the European Union FP7 Search-And-Rescue research projects ICARUS and SHERPA . Multiple project partners and collaborators have contributed towards making this important milestone possible, and we’d like to thank all of them for their various and ongoing support. 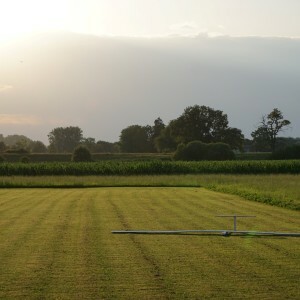 Finally, we are grateful towards the Hinwil and Rafz model aeroplane clubs for providing the airfield! Pilots: Rainer Lotz, Adrian Eggenberger. Development and Operations Team (Autonomous Systems Lab): Philipp Oettershagen, Rainer Lotz, Amir Melzer, Thomas Mantel, Bartosz Wawrzacz, Konrad Rudin, Thomas Stastny, Timo Hinzmann, Dieter Siebenmann, Dr. Gregory Hitz, Prof. Dr. Roland Siegwart. Wow what a move by Pixhawk ! Hats off to you guys, but can't see on your website, any credit being given to the Andrew Tridgel the main architect (lead developer) of the Arduplane. will there be more information about the modded TECS module? would be very interesting when building gliders. both thumbs up for the good work! What crisis would it tackle if it went 27 hours? @Rana: We are using the Pixhawk Autopilot Hardware, and are actually using a custom (i.e. developed at the Autonomous Systems Lab of ETH Zurich) firmware forked from Pixhawk that includes our own state estimation, control and thermal updraft tracking. Congrats. It is a super nice design and a great example of integration. Do you think APM code could benefit from those changes that you made to the code? Fantastic work! The continuous milestones this project keeps on achieving always amazes me. Would you be kind enough to share any detailed information about the MPPT? Thank you. i just like to build a glider. and it looks the tecs enhancement can catch thermals. my congratulations on your success. I am sure, Bertrand and Andre carefully watch your success story. Let me know if your Atlantik Solar can be scaled down to let me build much smaller version of your all-solar fixed-wing plane at Open Technology Lab. I have read your papers, technical specification, manual, I can laminate semi-flexible solar cells. My target is to make 4W single solar cell to fly. Since a single 4W solar cell has 0.5-0.6 voltage output I was trying to find 0.5 DC-DC step-up inverter and failed. 3V DC-DC step-up inverter is available to power up electronics with 5V a more. I am looking for a lightweight fixed-wing plane and plan to install few solar cells as cargo to perform a number of live tests then upgrade it with a larger number of solar cells ( as cargo) to charge installed battery. So my approach is exactly the inverse. 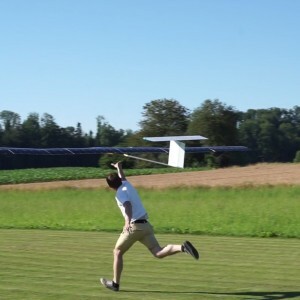 Is your team closed, project closed for the development of mini all-solar fixed-wing planes ? Actually, the code managing the thermal updraft tracking is a port (and extension!) of this http://diydrones.com/profiles/blogs/ardusoar-cross-country-x-plane-... here to Pixhawk, and yes, our plan is to push that back to the main repo if there is interest from the developer side. 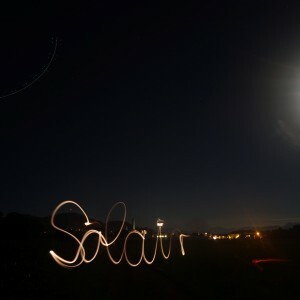 Also see the answer to Jesus A. Regarding the passive thermal compliance (i.e. the fact that the aircraft will just be "carried up with a thermal" instead of fighting it and trying to get down again), this is actually not a complicated implementation. See our publication. It's mostly just setting the speed weight parameter of TECS to 2.0 and avoiding that the integrator winds up during the time when h>h_ref. But currently there are now plans on our side to re-integrate that into the main pixhawk firmware because we have a completely different control infrastructure. If you are interested to re-integrate this for gliders, then we'd be happy to support your efforts of course. As mentioned in our publication, this is the MPPT brain / chip, and there is even a reference design of this available here ! Interesting approach, but you are aware of the effects of scaling on the aerodynamics (much lower efficiency once you operate below a certain Reynolds number) described in section 6.2 here ? Could you specificy again what you mean by "Is your team closed, project closed... ? " ?